Yesterday's visit to the Reynolda House was just like visiting the Frick Collection, only in Winston Salem, North Carolina. Not surprisingly, the Reynolda House, the cornerstone of Reynolda Village in Winston Salem was actually the "bungalow" of tobacco giant R. J. Reynolds. Built in the early 1900s, it gives you a snapshot of how life was for them - their grand reception room that could hold 800 people, their many sleeping porches and bedrooms, the lushly designed furniture and Wanamaker's decor. And as if that weren't enough, like all the Gilded Age folks, they made they could easily access their pursuits - in this case, the absolutely superawesome basement entirely floored with rubber so they could roller skate all throughout but which also included a supercool shooting gallery, a bowling club, and full-on Art Deco, post-Prohibition bar. Plus a giant, (like, needs a giant room of its own) 2,500-pipe Aeolian organ, one of a handful in existence, and which took 60-something crates to transport via ship and rail. Their art collection stands out, the house having been converted into a museum celebrating important pieces of American art. 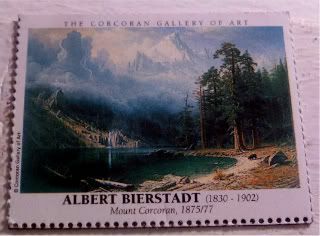 So you can walk down the hall seeing great paintings by Albert Bierstadt (not the one on this magnet that I got from DC's Corcoran, but close), Frederic Edwin Church, Grant Wood, Frank Stella, and pieces by Tiffany. And, if you explore enough, it goes beyond our borders with shawls from Chanel, porcelain birds by Royal Worcester, and monogrammed china by Minton. I loved walking through such an gorgeous house, looking at their rooms and their clothes and toys, and of course, at all of their art. But, it was their small Church exhibition that I really enjoyed - a quiet room at the far end of the house, where they lovingly exhibited Church's The Andes of Ecuador against the back wall, with red velvet drapes on either side, like they used to exhibit large paintings in the old days. Apparently, back in the day, painters such as Church and Bierstadt, had their their paintings unveiled publicly, the events were like rock concerts, people lining up and gathering round to see them. And they'd have these little opera glasses with them - Mark Twain was a fan of these little opera glasses, because it brought people into the painting, allowing them to see the tiniest of details. And, it's true, the closer in you go to either of these two masterful artists' work, the more you notice. A tiny dab of animal in the woods or the sky, a tiny brushstroke of a faraway village or church spire.